When Were Vaccinations Invented ? Most historians document the first vaccination to be around 1796 when English doctor Edward Jenner observed that people working in close proximity to cows were completely immune to the smallpox virus. For those that don’t know much about the virus or its severity then imagine chicken pox or the measles but much worse. 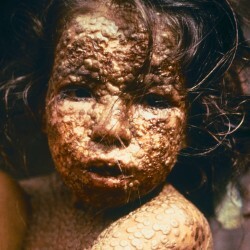 The picture above is of a young Bangladeshi girl taken in 1973 and demonstrates how severe the outbreak on the body was. Not something you’d want to pick up, and with death from infection being as high as 80% in children it wasn’t a surprise why this virus was so feared. Going back to Dr Jenner’s original observations he quickly came to the conclusion that some how the workers were picking up the less dangerous cowpox virus which in turn left them completely immune to the far more dangerous smallpox. After some experimentation he injected an 8 year old boy with a small amount of cowpox and confirmed his original hypothesis. Within 3 years 100,000 British people were vaccinated and saved from the potentially fatal virus. By 1979 the World Health Organisation (WHO) had declared smallpox to be the first infectious disease to have been eradicated from the face of the earth. Now a days this killer virus exists only in a few select laboratories throughout the world! Also Check out... Who was The Tallest Man ever?